Video on Instagram is now a reality. 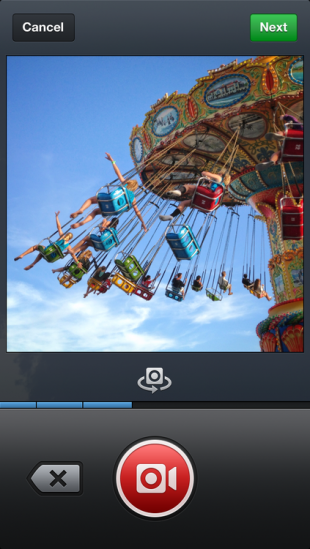 Video on Instagram allows you to record 15-second clips, apply filters and share. Image courtesy Instagram. Facebook has created its own competitor to Twitter’s Vine. Video on Instagram is a new functionality on Instagram that allows users to record clips, apply filters, and share them with friends as they currently do with photos. Where Vine videos are limited to 6 seconds, Instagram videos will max out at 15 seconds. Unlike Vine, videos on Instagram will not loop. Another functionality built with video beautification in mind is Cinema. Cinema is a functionality that allows you to stabilize shaky videos for better quality clips. As Systrom said, “this changes everything.” It gives individual users and companies the ability to film stabilized, potentially professional quality visuals without having to invest in fancy equipment. It can be spontaneous, on-the-spot, and still well-composed. Video on Instagram has a few immediate advantages over Vine. First, Instagram already has 130 million users who will immediately get access to this new functionality. They don’t need extra time to build up that audience. Second, many companies already have solid audiences built up on Instagram that they can now offer videos to. This is a far easier scenario than having to attract a brand new audience on Vine. Finally, Video on Instagram is available to Android and iOS users from the get-go, something the former group is sure to appreciate. So, will you be using Video on Instagram? Or do you still prefer Vine? Let us know in the comments. Be sure to follow HootSuite on Instagram as we explore this new functionality. Join us by watching our first video and creating your own #DoinItRight Instagram videos.